August is here. 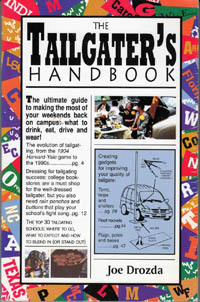 It's been months since you've thought about tailgating, hasn't it? There were things that came to mind at the end of last season, that you meant to do, but now the days have passed by and you don't even remember what it was that you thought you needed to do. Fear not! Here are simple ideas to get you started. After thinking about the items below you can print out a handy checklist by clicking the checklist link. You can make this season a great one! Make a list of your equipment. There will be tables, chairs, tents, grills, coolers, flags, and much more. Get this equipment out of winter storage and check each piece for cleanliness, serviceability or wear and tear, and it's importance in your tailgate set-up. Is there something you need to replace? Is there a new gadget or piece of equipment that is far better than something that you are using? Check for end of summer bargains on web sites and in the sale tabloids. This time of year cookout and camping gear (tailgate equipment) generally goes on sale. Get out the schedule for home games and check the times. 7PM starts and Noon starts require entirely different menus. Contact your tailgating companions to get their thoughts. Start planning the menu for the first game. Contact us if you have technical questions.